Kyler Murray is college football’s 2018 Heisman Trophy winner. He beat out two other top tier quarterbacks in Ohio State’s Dwayne Haskins and Alabama’s Tua Tagovailoa. 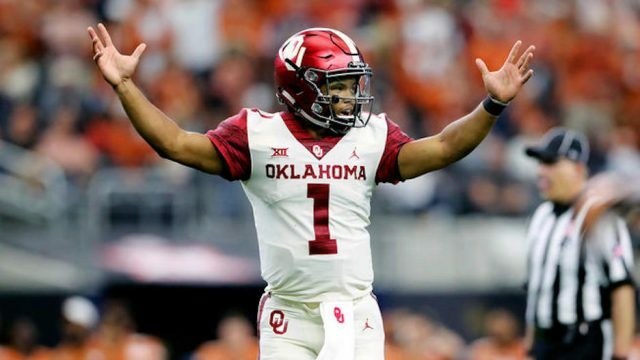 This marks the second consecutive year that an Oklahoma quarterback has been crowned as the best player in college football. He is the seventh Oklahoma player to win the award. Murray dominated opponents this season with 4,503 passing yards and 37 touchdown passes while leading his team to a Big 12 championship and playoff berth. He also compiled 892 yards and 11 touchdowns on the ground. The star quarterback was drafted by the Oakland A’s with the ninth overall pick in the 2018 MLB draft, but will soon need to decide if he wants to pursue a career in Major League Baseball or the National Football League.